HARLEM WEEK began in 1974 as HARLEM DAY, a day of encouragement and fellowship in Harlem for New Yorkers. Given the huge success of the celebration, additional days were added to showcase the community’s rich economic, political and cultural history. HARLEM WEEK is now unquestionably an internationally renowned brand with participants and visitors from around the world and offers over 112 events throughout the summer to over 2 million attendees. HARLEM WEEK celebrates the best of Harlem, promoting Harlem’s rich African, African-American, Caribbean, Hispanic and European history, culture, arts, religion, entertainment and sports. The theme for HW 2018 was WOMEN TRANSFORMING OUR WORLD: Past, Present, and Future, and since HARLEM WEEK was in its 44th year, we acknowledged 44 inspiring women who have changed the world or are on their way to changing the world. From past singers like Ella Fitzgerald to current-day activists like Jackie Rowe-Adams to future voices like Yolanda Renee King, Dr. Martin Luther King Jr.'s granddaughter - the 44 women selected have shattered the mold and transformed the status quo in a broad range of fields. The second theme was OUR COMMUNITY WITHIN THE COMMUNITY: SALUTING LGBTQ. Harlem has a long, inextricable, inspiring history with the LGBTQ community. Its legendary establishments and artists include Clam House speakeasy, performer Ma Rainey author James Baldwin, painter Richard Bruce Nugent, philosopher Alain LeRoy Locke, poet Langston Hughes, novelist Countee Cullen and even modern celebrity Neil Patrick Harris. 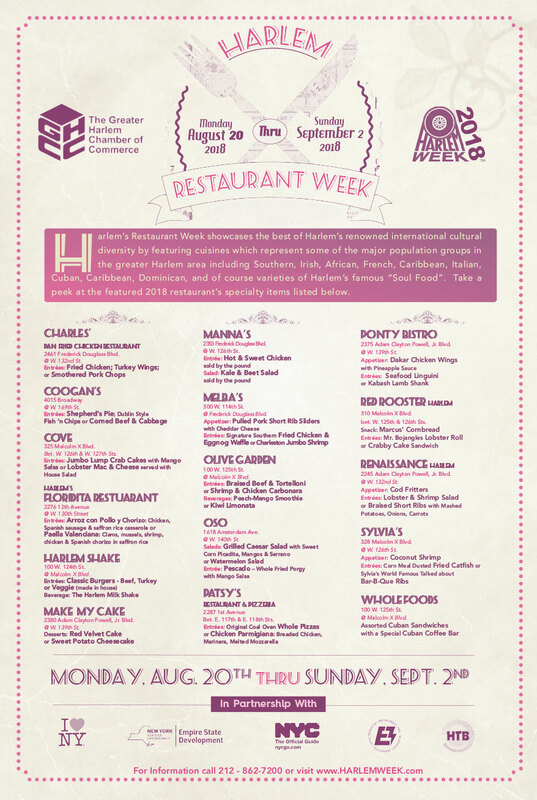 One of the year's highlights was the HARLEM WEEK RESTAURANT WEEK! See below for a list a participating restaurants. CLICK HERE TO SEE THE SPECIALTY ITEMS OFFERED. HARLEM WEEK WRAPPED UP WITH THE PERCY SUTTON HARLEM 5K RUN, HEALTH WALK, AND CHILDREN'S RUN. For more on HARLEM WEEK click here.